This summer, Wily West* (a company dedicated to premiering new work by Bay Area writers) joins a select group of local companies prepared to accept the challenge of presenting multiple plays in repertory. Time was, in England and in the U.S. as well, that “repertory theatre” was the norm for most actors. In “repertory”, a small company of actors would master multiple plays, then play them for a season in rotation, a different play each night. In some cases, an actor might learn an entirely new play every single week! As one might imagine, most of the plays in such situations were known classics. Once an actor had learned, for example, a role such as Eliza Doolittle in Shaw’s “Pygmallion,” she might play that same part many times over a number of years in various repertory companies. It was a system famous for its challenges and its effectiveness in training actors. Alas, it is rarely favored today, as few companies can afford to hire actors for an entire season and modern union rules make it extremely difficult to demand a full out repertory season from any company. It is probably just as well. We don’t want to work actors to death. But on those rare occasions when a company steps up to the challenge of repertory, it is well worth our sitting up and taking notice. In San Francisco, we are lucky to have a number of companies successfully attempt this approach in recent years, presenting multiple plays running simultaneously in repertory style. Last year, Boxcar Theatre performed several of Sam Shepherd’s plays in repertory, and the avant garde Cutting Ball Theater gave us a festival of Strindberg’s plays. And both Marin Shakespeare and California Shakespeare Theatre offer summer seasons of Shakespearean and other new and classic plays in repertory. The peripatetic Just Theater Company (currently in residence at the Live Oak Theatre in Berkeley) is also presenting two plays in repertory this summer. Wily West is unique in being a company that exclusively produces new work by local playwrights while relying 100% on local talent for all aspects of every production. In the four years since its founding, Wily West has offered world premiere productions by over two dozen Bay area playwrights, an astonishing and admirable accomplishment. 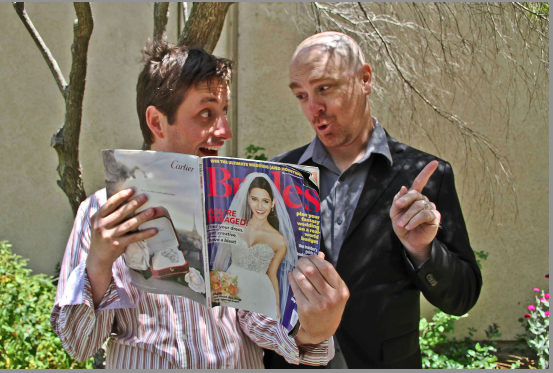 Philip Goleman and Scott Ragle in “Lawfully Wedded”. Photo credit: Jim Norrena. 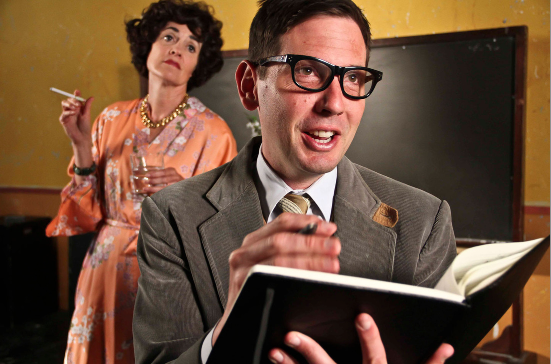 As always, the plays being presented by Wily West this summer are each world premiers. The repertory will include “Lawfully Wedded”, a collaboration amongst three San Francisco playwrights, Morgan Ludlow, Kirk Shimano and Alina Trowbridge, and “Gorgeous Hussy: An Interview with Joan Crawford”, by Morgan Ludlow. Playwright Morgan Ludlow is not only the founder of Wily West, but has seen full productions of over a dozen of his own full length plays, as well as numerous one acts. A remarkably versatile artist, Mr. Ludlow has also served as the producing director of the Playwrights’ Center of San Francisco and is a published poet as well. His background includes stints as an acting teacher (specializing in acting for dancers) and worked as a business manager for Teatro Zinzanni. On his personal website, Kirk Shimano notes that he was named after Captian James Tiberius Kirk (of the Starship Enterprise) and wonders, “If that’s not nerd cred, I don’t know what is.”) For a day job, he works as a lighting technical director for Industrial Light and Magic. He also has been known to indulge in both short fiction and poetry as well as writing plays. Sometimes he makes movies, too. Alina Trowbridge is much admired for her mastery of the ten-minute play. Her efforts in this genre have been produced far and wide in Berkeley, Boston, New York, New Hampshire, Seattle and, of course, San Francisco. One of her plays was anthologized in “Best Ten Minute Plays of 2005”. She writes full length plays as well. The first of the summer’s two shows in repertory, “Lawfully Wedded”, is a collection of related scenes by each of the aforementioned playwrights. Together, the scenes (essentially a collection of short plays), explore the recent movement towards marriage quality in the U.S. , while detailing the experiences of male couple Bill and Jason as they transition from boyfriends to fiances to newlyweds. Legally, at long last. Susan Jackson as Joan Crawford and Ryan Hayes Roy in “Gorgeous Hussy”. Photo credit: Jim Norrena. The second production, “Gorgeous Hussy”, brings to life film star Joan Crawford as recreated by Susan Jackson. Ms. Jackson is an accomplished acting teacher as well as an award winning performer. She has appeared with many of the area’s leading companies including the Pear Avenue Theatre Company, TheatreWorks and the Palo Alto Players, as well as winning awards for her own playwrighting efforts. Not surprisingly for an actress associated with Wily West, she is also a published writer of both short stories and poetry. In this two-hander (a play for two actors), she is partnered by Ryan Hayes in the role of an ambitious journalist out to interview Ms. Crawford. Hayes has been acting in San Francisco for the past fifteen years, working with multiple companies. Last summer, he delivered a remarkable performance as Antonio in Custom Made Theatre‘s fine production of “A Merchant of Venice”. His one man show about Walt Whitman, “Boys Together Clinging”, was produced by the much admired San Francisco Theatre Pub to wide acclaim. Want to learn more? This highly literate company offers a remarkable production blog which includes diary entries, interviews and more from the cast and crews of both “Lawfully Wedded” and “Gorgeous Hussy”. Both plays will be performed at The Exit Theatre in San Francisco. “Lawfully Wedded” opens Thursday, July 25th, and “Gorgeous Hussy” follows on July 26th. Both plays will continue in repertory through mid-August. For a full schedule of performances, click here.